A classic favorite! Freshly made pasta smothered in creamy cheddar cheese sauce. Vegetarian friendly. Cheese Sauce: Water, cheese sauce seasoning [cheddar cheese, (pasteurized milk, cheese cultures, salt, enzymes), ricotta cheese (whey, milkfat, lactic acid, salt), enriched wheat flour (wheat flour, niacin, reduced iron, thiamine mononitrate, riboflavin, folic acid), palm oil, modified food starch, whey, natural flavors, buttermilk, salt, corn syrup solids, butter (cream, salt), disodium phosphate, dipotassium phosphate, sodium citrate, yeast extract, annatto extract (color)], food starch-modified. 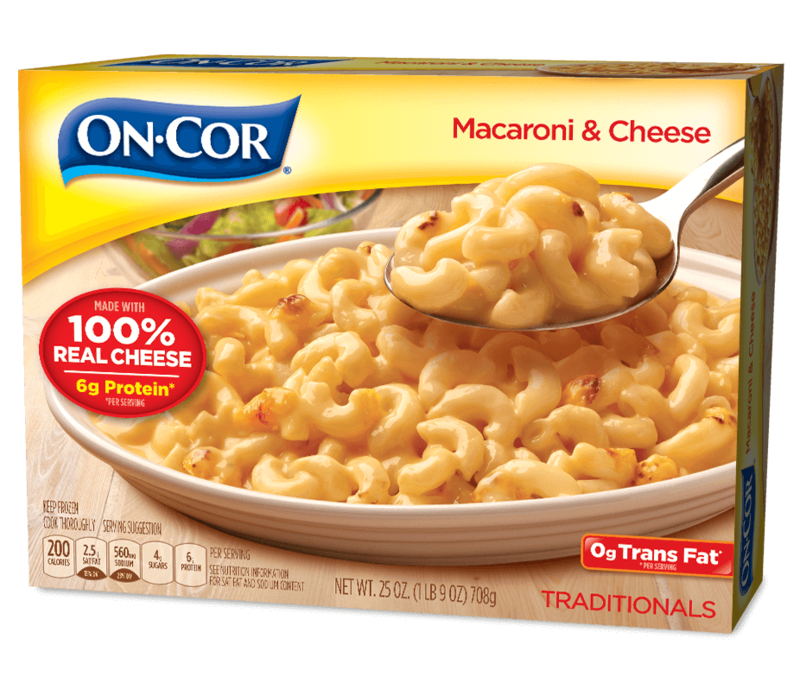 Cooked Enriched Macaroni Product: Water, semolina enriched flour (niacin, ferrous sulfate, thiamine mononitrate, riboflavin, folic acid). Carefully remove baking sheet from oven with oven mitts and let stand 2 minutes. Stir well before serving. Carefully peel back film, separate any portions still frozen and stir well. Heat on HIGH for 4 to 5 minutes or until fully cooked. Try making a tasty and tangy buffalo mac. Just add shredded cooked chicken, mix in Buffalo-style sauce and add breadcrumbs with garlic powder to the top. Enjoy! I use a food sealing system like Seal-a-Meal to freeze extras. I use bags that can be microwaved or boiled so I just grab one of these veggies and dinner is a snap! "I love the affordable price! Thanks so much for great food that we love!!"